Wileyfox wants to gift their fans on every 1 000 likes on their Facebook page. To enter in this 25 Wileyfox Swift 2 Plus Smartphones Giveaway like their Facebook page and follow few simple steps listed down below! With a balanced flow and elegance to its form, Swift 2 Plus makes a sophisticated statement. Its premium aluminium design is a work of art created in 17 steps, including two rounds of CNC diamond cutting. The result? Delicate curves in a light, thin body. In one word: gorgeous. With Swift 2 Plus, it’s all about capturing quality. Its 16MP camera, Samsung camera sensor with ISOCELL technology and PDAF (Phase Detection Auto Focus) lets you snap sharp images quickly. And its 1.0mM pixel size means bigger pixels for better photos in low light conditions. 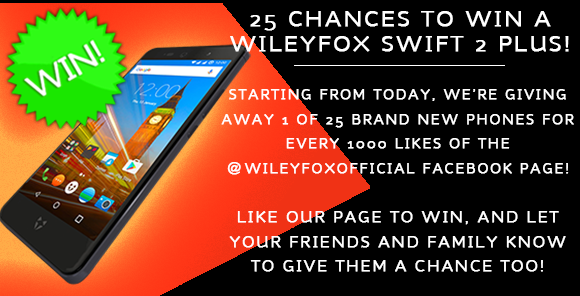 STEP 2 – Like Wileyfox on Facebook. STEP 3 – Check their Facebook page for winner announcements. Not known how winners are going to be announced, probably on Facebook.